I grew up in what’s called the “bible belt,” where there was a church on every corner, but it could have just as easily called itself the “burger belt.” Hamburger joints abound in small town Texas and you can pretty much guarantee that there is a hamburger on the menu in just about every restaurant in town, even fine dining. But recently, I’ve learned that my hamburger knowledge has dropped off in standards. If I had my druthers, on a drive-thru night, I will pick Mexican food. So, for years, hamburgers as a regular meal have been off my radar. It’s also unbelievably frustrating because when she doesn’t eat, she gets cranky and unreasonable. Yeah, even more unreasonable than what’s typical for an almost-3-year-old. And believe me, almost-3-year-olds are already UNBELIEVABLY UNREASONABLE. So, yes, I often give in honor her request for a hamburger. Because I want her to eat. I even bought some of those frozen already made hamburgers and stuck them in my freezer, but I haven’t made them yet because I fear that she will refuse it at home and then I lose 90 percent of my dinner options and we WILL fight. Anyhoo, I’ve come to realize that I haven’t been taking full advantage of my chance to eat a variety of hamburgers. I mean, Sonic has a pretty decent burger on their dollar menu, and there’s one right down the street from our house. And we don’t even have to get out of the car. But I’m sick of Sonic and Whataburger and all the other unmentionable places that all my healthy friends would quake in their shoes if they knew we were regularly eating there. The other night some friends suggested that we hit up Dan’s Hamburgers. 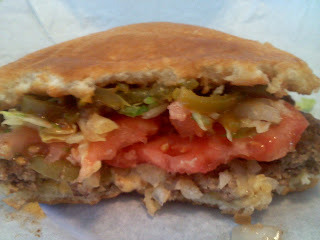 I got the hickory burger with jalapenos. It was pretty damn tasty. The fries left something to be desired, but Annika and I are not fry freaks anyway. We like burgers and shakes. So anyway, if you are an Austinite, what’s your favorite burger joint? This phase ain’t gonna last forever, I might as well take advantage of it and learn where all the best joints are in town. 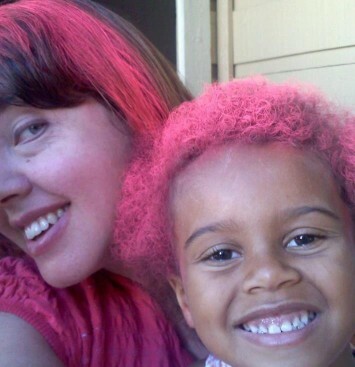 ← All of Me: are biracial children who identify with all their heritages happier? p. terrys, dan’s, mighty fine, and galaxy are all good. black sheep lodge has an awesome buffalo burger (as in style, not animal) terra burger is ok, the 183 location has a good playground. and phil’s has some great burgers. i prefer the rosedale, but there are multiple winners. burger tex is a throw back. good burgers and a topping bar. only been to the one near the “y”. there is a place called wholly cow in a convenience store on s. lamar that gets some raves, but i have not tried it yet. across from where chango’s used to be. not a big fan of five guys. hut’s is overrated. but i think a burger and a shake from dirty martins can’t be beat. not that i eat that crap. Bryan, you had me at convenience store. Can you tell that one of my favorite after-bar foods as a youngster was the fried jalapenos at Allsups? Wait, what happened to Changos? I need to get out more…..
Don’t forget 5 Guys and Hut’s. Mighty Fine is my fav. I love me a good burger. Oh and Terra Burger on the drag is very tasty too, free range as well. I like Huts. I was actually thinking of taking her there this weekend. But I’ve heard other people say it’s overrated, like Bryan did above. Now maybe thinking we should break down and eat at P. Terry’s. I have often thought of eating there, but there’s always a line. I hate lines. Maybe it will be worth it. I love P. Terry’s. There is one on Wm Cannon just west of Mopac, the line is usually short and moves fast. I also like Mighty Fine, just wish they had a drive through! Depending on your northward quotient, you may like Top Notch or Hill-Berts, both old school burger joints on Burnet. Both have drive thrus, I believe, or at last “stay in your car” options. I liked Hill-Berts but have not yet tried Top Notch. OK, this is a weird place to get a hamburger, but when I was pregnant, I fell in love with the hamburgers at—- Austin Java. Oh. Wow. They are the best hamburgers I’ve had in Austin. And I really love hamburgers. It’s the meat— really really good meat. Try it. You won’t be sorry. They have this really delicious peanut stew there too. It’s yummy.